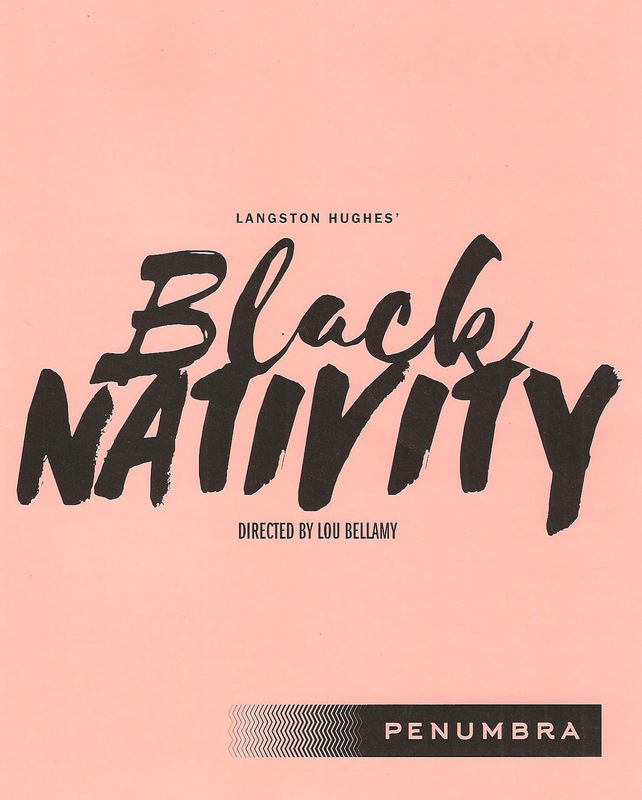 There truly is no better place to experience the "joyful noise" of the holiday* season than at Penumbra Theatre's annual production of Black Nativity. Despite it being a 30+ year #TCTheater holiday institution, this is only my second time seeing the show. If you've never seen it before, you need to add it to your holiday theater rotation to experience the pure joy radiating from the stage. And if you have seen it before, you know just how heart-warming and life-affirming it is. This 80-minute theater/ music/ dance/ poetry experience continues through December 23, so there's plenty of time to get to St. Paul. 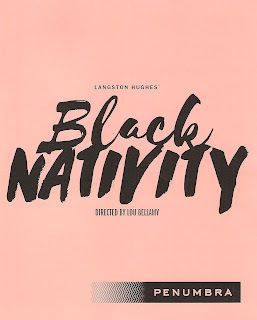 Black Nativity is the traditional nativity story as expressed through black culture, starting with the text by the great African American poet Langston Hughes. Read by narrator Jennifer Whitlock in short phrases or longer stanzas between the songs, his words are poetic and powerful, casting this familiar (to those of us who grew up in the Christian tradition) story in a new light. Or rather, a new blackness. The story of a young couple in need turned away from a fancy hotel, told "there's no room for you here," takes on a different meaning when it's a black couple. The nativity is a beautiful story that has been told in many ways for thousands of years, inspiring people around the world, as it continues to do here. The nativity story is also expressed through music and dance. 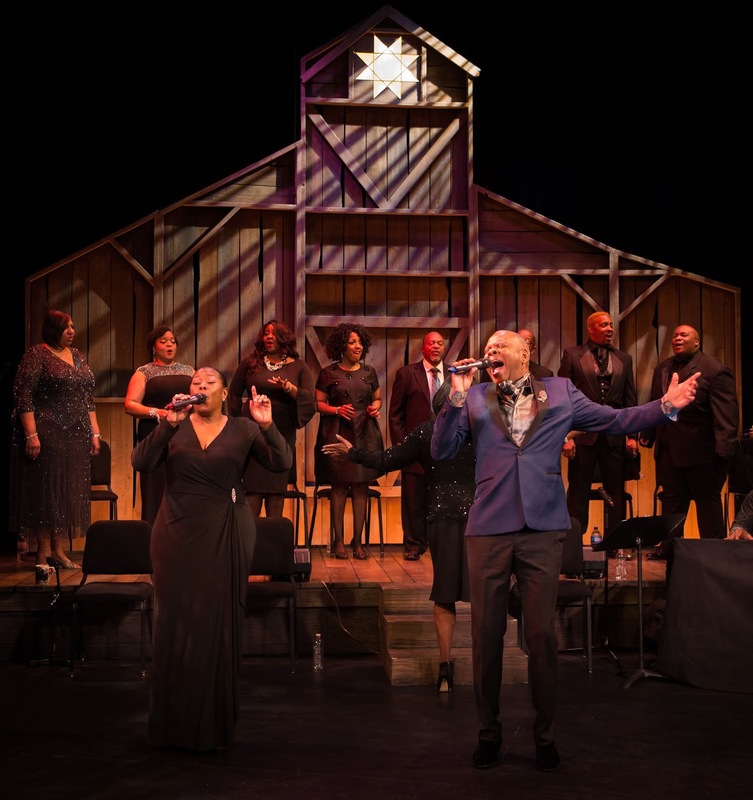 Led by music director Sanford Moore on keyboard, the gospel music is enough to raise the rafters of Penumbra's intimate theater space. Featuring a five-piece band, an eight-person choir from Kingdom Life Church in Robbinsdale enthusiastically directed by soloist Yolande Bruce, and featured singers and #TCTheater favorites Greta Oglesby and Dennis W. Spears, the songs fit the stages of the story being told, and further express the joyful spirit of the story. Some are familiar to me (including "I Wonder as I Wander," "Go Tell It On the Mountain," and "The Little Drummer Boy"), but more are unfamiliar to me. And while the details of the theology expressed may not match my personal theology, I appreciate the joy and faith behind it. There's nothing like a gospel choir (with a few singalong moments) to life one's spirits. And lastly, the dancing! In a couple all too brief moments, Mary and Joseph are embodied by dancers Taylor Collier/MerSadies McCoy (in rotation) and Jason Lewis, as choreographed by Uri Sands of TU Dance. The fluid contemporary movement is so expressive and so exquisite, I wanted more of it! In the past 30+ years, Penumbra's Black Nativity has gone through several transformations, sometimes a large-scale show, sometimes more stripped down. This year's show is virtually the same as the one I saw three years ago and lands perhaps somewhere in the middle. The focus is on the music and the words, with simple clean design and production elements that lets them shine. The world today often seems like a hopeless and helpless place. Black Nativity reminds us of the troubles we've lived through (and more specifically, that the African American community has lived through), and offers an unfailing hope and belief in the goodness that exists in the world and the better days to come. The joyful noise of Black Nativity continues at Penumbra Theatre in St. Paul through December 23.